Part three of my presentation of the four sermons of John Henry Cardinal Newman on the Anti-Christ delivered in 1835 before his conversion. Part I is here and Part II is here. Newman makes this observation at the end which I think is of pertinence to us all. “How shall we feel when the end comes, if we be found mere children of this world and of its great cities; with tastes, opinions, habits, such as are found in its cities; with a heart dependent on human society, and a reason moulded by it! What a miserable lot will be ours at the last day, to find ourselves before our Judge, with all the low feelings, principles, and aims which the world encourages; with our thoughts wandering (if that be possible then), wandering after vanities; with thoughts which rise no higher than the consideration of our own comforts, or our gains; with a haughty contempt for the Church, her ministers, her lowly people; a love of rank and station, an admiration of the splendour and the fashions of the world, an affectation of refinement, a dependence upon our powers of reason, an habitual self-esteem, and an utter ignorance of the number and the heinousness of the sins which lie against us!” How easy it is for us to be so utterly consumed by the things of this World that we leave little or no time for God! As C.S. Lewis noted in the Screwtape Letters: “Prosperity knits a man to the World. He feels that is ‘finding his place in it,’ while really it is finding its place in him. His increasing reputation, his widening circle of acquaintances, his sense of importance, the growing pressure of absorbing and agreeable work, build up in him a sense of really being at home on Earth, which is just what we want. You will notice that the young are generally less unwilling to die than the middle-aged and the old.” A salutary warning against worldliness is the main lesson I take away from this sermon. The Anti-Christ will come when it is his time. Our time will come regardless of when his time comes. Newman’s third sermon on the Anti-Christ. THE city spoken of in these words is evidently Rome, which was then the seat of empire all over the earth,-which was supreme even in Judaea. We hear of the Romans all through the Gospels and Acts. Our SAVIOUR was born when His mother, the Blessed Virgin, and Joseph, were brought up to Bethlehem to be taxed by the Roman governor. He was crucified under Pontius Pilate, the Roman governor. St. Paul was at various times protected by the circumstance of his being a Roman citizen; on the other hand, when he was seized and imprisoned, it was by the Roman governors, and at last he was sent to Rome itself, to the emperor, and eventually martyred there, together with St. Peter. Thus the sovereignty of Rome, at the time when CHRIST and His Apostles preached and wrote, which is a matter of historical notoriety; is forced on our notice in the New Testament itself. It is undeniably meant in the text, by the great city which reigneth over the kings of the earth. This great city is described under the image of a woman, cruel, profligate, and impious. She is described as arrayed in all worldly splendour and costliness, in purple and scarlet, in gold and precious stones, and pearls, as shedding and drinking the blood of the saints, till she was drunken with it Moreover she is called by the name of “Babylon the Great,” to signify her power, wealth, profaneness, pride, sensuality, and persecuting spirit, after the pattern of that former enemy of the Church. I need not here relate how all this really answered to the character and history of Rome at the time St. John spoke of it. There never was a more ambitious, haughty, hardhearted, and worldly people than the Romans; never any, for none else had ever the opportunity, which so persecuted the Church. Christians suffered ten persecutions at their hands, as they are commonly reckoned, and very horrible ones, extending over two hundred and fifty years. The day would fail to go through an account of the tortures they suffered from Rome; so that the Apostle’s description was as signally fulfilled afterwards as a prophecy, as it was accurate at the time as an historical notice. This power, who was to rise upon the kings, is Antichrist; and I would have you observe how Rome and Antichrist stand towards each other in the prophecy. Rome is to fall before Antichrist rises; for the ten kings are to destroy Rome, and Antichrist is then to appear and supersede the ten kings. As far as we dare judge from the words, this seems clear. St. John says, “the ten horns shall hate and devour” the woman: and Daniel says, “I considered the horns, and behold, there came up among them another little horn” with “eyes like the eyes of a man, and a mouth speaking great things:”-that is Antichrist. In the first place, the Roman empire did break up, as foretold. It divided into a number of separate kingdoms, such as our own, France, and the like; yet it is difficult to number ten accurately and exactly. Next, though Rome certainly has been desolated in the most fearful and miserable way, yet it has not exactly suffered from ten parts of its own former empire, but from barbarians who came down upon it from regions external to it; and, in the third place, it still exists as a city, whereas it was to be “desolated, devoured, and burned with fire.” And, fourthly, there is one point in the description of the ungodly city, which has hardly been fulfilled at all in the case of Rome. She had “a golden cup in her hand full of abominations,” and made “the inhabitants of the earth drunk with the wine of her fornication;” expressions which imply surely some seduction or delusion which she was enabled to practise upon the world, and which, I say, has not been fulfilled in the case of that great imperial city upon seven hills of which St. John spake. Let us consider some of these points more at length. I say, the Roman empire has scarcely yet been divided into ten. The prophet Daniel is conspicuous among the inspired writers for the clearness and exactness of his predictions; so much so, that some infidels, overcome by the truth of them, could only take refuge in the unworthy, and at the same time most unreasonable and untenable supposition, that they were written after the events which they profess to foretell. But we have had no such exact fulfilment in history of the ten kings; therefore we must suppose that it is yet to come. With this accords the ancient notion, that they were to come at the end of the world, and last but a short time, Antichrist coming upon them. There have, indeed, been approximations to the number, yet, I conceive, nothing more. Now observe how the actual state of things corresponds to the prophecy and to the primitive interpretation of it. It is difficult to say whether the Roman empire is gone or not: in one sense, it is,-for it is divided into kingdoms; in another sense, it is not,-for the date cannot be assigned at which it came to an end, and much might be said in various ways, to show that it might be considered still existing, though in a mutilated and decayed state. But if this be so, and if it is to end in ten vigorous kings, as Daniel says, then it must one day revive. Now observe, I say, how the prophetic description answers to this account of it. “The Beast,” that is, the Roman empire, “the Monster that thou sawest, was and is not, and shall ascend out of the abyss, and go into perdition.” Again, mention is made of “the Beast that was, and is not, and yet is.” Again, we are expressly told that the ten kings and the empire shall rise together; the kings appearing at the time of the monster’s resurrection, not in its languid and torpid state. “The ten kings …… have received no kingdom as yet, but receive power as kings one hour with the beast.” It then, the Roman power is still prostrate, the ten kings have not come; and if the ten kings have not come, the destined destroyers of the woman, the full judgments upon Rome, have not yet come. Thus the full measure of judgment has not fallen upon Rome; yet her sufferings, and the sufferings of her empire, have been very severe. St. Peter seems to predict them, in his First Epistle, as then impending. He seems to imply, that CHRIST’S visitation, which was then just occurring, was no local or momentary vengeance upon one people or city, but a solemn and extended judgment of the whole earth, though beginning at Jerusalem. “The time is come,” he says, “when judgment must begin at the house of GOD (at the sacred city); and, if it first begin at us, what shall the end be of them that obey not the Gospel of GOD? And if the righteous scarcely be saved” (i. e. the remnant who should go forth of Zion, according to the prophecy, that chosen seed in the Jewish Church which received CHRIST when He came, and took the new name of Christians, and shot forth and grew far and wide into a fresh Church, or, in other words, the elect whom our SAVIOUR speaks of as being involved in all the troubles and judgments of the devoted people, yet carried safely through); “if the righteous scarcely be saved, where shall the ungodly and the sinner appear,”-the inhabitants of the world at large? Hosts of barbarians came down upon the civilized world, the Roman empire. One multitude,-though multitude is a feeble word to describe them,-invaded France, which was living in peace and prosperity under the shadow of Rome. They desolated and burned town and country. Seventeen provinces were made a desert. Eight metropolitan cities were set on fire and destroyed. Multitudes of Christians perished even in the churches. Such were the scourges by which the fourth monster of Daniel’s vision was brought low, “the LORD GOD’S sore judgments, the sword, the famine, and the pestilence.” Such was the process by which “that which letteth,” (in St. Paul’s language) began to be “taken away;” though not altogether removed even at this day. These are great and notable events, and certainly form part of the predicted judgment upon Rome; at the same time they do not adequately fulfil the prophecy, which says expressly, on the one hand, that the ten portions of the empire itself which hath almost been slain, shall rise up against the city, and “make her desolate and burn her with fire,” which they have not yet done; and on the other hand, that the city shall experience a total destruction, which has not yet befallen her, for she still exists. St. John’s words on the latter point are clear and determinate. “Babylon the great is fallen, is fallen; and is become the habitation of devils, and the hold of every foul spirit, and a cage of every unclean and hateful bird;” words which would seem to refer us to the curse upon the literal Babylon; and we know how it was fulfilled. 1. First, why has not Rome been destroyed hitherto? How was it that the barbarians left it? Babylon sunk under the avenger whom GOD brought against it-Rome has not: why is this? for if there has been a something to procrastinate the vengeance due to Rome hitherto, peradventure that obstacle may act again and again, and stay the uplifted hand of divine wrath till the end come. The cause seems to be simply this, that when the barbarians came down, GOD had a people in that city. Babylon was a mere prison of the Church; Rome had received her as a guest. The Church dwelt in Rome, and while her children suffered in the heathen city from the barbarians, so again they were there the life and the salt of the city where they suffered. Christians understood this at the time, and availed themselves of their position. They remembered Abraham’s intercession for Sodom, and the gracious announcement made him, that had there been ten righteous men therein, it would have been saved. When the city was worsted, threatened, and at length overthrown, the Pagans had cried out that Christianity was the cause of this. 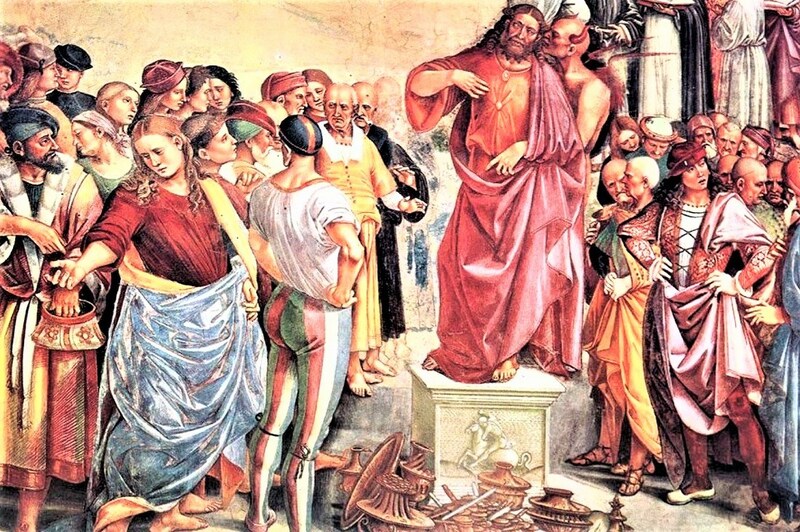 They said they had always flourished under their idols, and that these idols and devils (gods as they called them) were displeased at them for the numbers among them who had been converted to the faith of the Gospel, and had in consequence deserted them, given them over to their enemies, and brought vengeance upon them. On the other hand, they scoffed at the Christians, saying, in effect, “Where is now your GOD? Why does He not save you? You are not better off than we;”-like the impenitent thief, “If Thou be the CHRIST, save Thyself and us;” or, like the multitude, “If He be the SON of GOD, let Him come down from the Cross.” This was during the time of one of the most celebrated bishops and doctors of the Church, St. Augustine; and he replied to their challenge. He replied to them, and to his brethren also, some of whom were offended and shocked that such calamities should have happened to a city which had become Christian. He pointed to the cities which had already sinned and been visited, and showed that they had altogether perished, whereas Rome was still preserved. Here then he said was the very fulfilment of the promise of GOD, announced to Abraham; for the sake of the Christians in it, Rome was chastised, not overthrown utterly. Historical facts support St. Augustine’s view of things: GOD showed visibly, not only provided secretly, that the Church should be the salvation of the city. The fierce conqueror, Alaric, who first came against it, exhorted his troops, “to respect the Churches of the Apostles St. Peter and St. Paul, as holy and inviolable sanctuaries;” and he gave orders that a quantity of plate consecrated to St. Peter should be removed into his Church from the place where it had been discovered. 2. Thus from the Goth, Hun, and Vandal, did the Christian Church shield the guilty city in which she dwelt. What a wonderful rule of GOD’S providence is herein displayed, which occurs daily! the Church sanctifies yet suffers with the world, sharing its sufferings yet lightening them. In the case before us, it has (if we may humbly say it,) suspended, to this day, the vengeance destined to fall upon her who was drunk with the blood of the martyrs of JESUS. What vengeance has never fallen; it is still suspended; nor can reason be given why Rome has not fallen under the rule of GOD’S general dealings with His rebellious creatures, and suffered (according to the prophecy), the fulness of GOD’S wrath begun in her, except that a Christian Church is still in that city, sanctifying it, interceding for it, saving it. That part of the Christian Church, (alas!) has in process of time become infected with the sins of Rome itself, and learned to be ambitious and cruel after the fashion of those who possessed the place aforetimes. Yet if it were what some would make it, it it were as reprobate as heathen Rome itself, what stays the judgment long ago begun? why does not the Avenging Arm, which made its first stroke ages since, deal its second and its third, till the city has fallen? why is not Rome as Sodom and Gomorrah, if there be no righteous men in it? This then is the first remark I would make as to the fulfilment of the prophecy which is yet co come; perchance, through GOD’S mercy, it may be procrastinated even to the end, and never be fulfilled. Of this we can know nothing one way or the other. To sum up what I have said. The question asked was, Is not (as is commonly said and believed among us) Rome mentioned in the Apocalypse, as having especial share in the events which will come at the end of the world by means or after the time of Antichrist. I answer this, that Rome’s judgments have come on her in great measure, when her empire was taken from her; that her persecutions of the Church have been in great measure judged, and the Scripture predictions concerning her fulfilled; that whether or not, she shall be further judged depends on two circumstances, first, whether “the righteous men” in the city who saved her when her judgment first came may not, through GOD’S great mercy, be allowed to save her still; next, whether the prophecy relates in its fulness to Rome or to some other object or objects of which Rome is a type. And further, I say, that if Rome is still to be judged, this must be before Antichrist comes, because Antichrist comes upon and destroys the ten kings, and lasts but a short space, but the ten kings are to destroy Rome. On the other hand, so far would seem to be clear, that the prophecy itself has not been fully accomplished, whatever we decide about Rome’s concern in it. The Roman empire has not yet been divided into ten heads, nor has it yet risen against the woman, whoever she stands for, nor has the woman yet received her ultimate judgment. Cardinal Newman asked: “Whether “the righteous men” in the city (Rome) who saved her when her judgment first came may not, through GOD’S great mercy, be allowed to save her still; next, whether the prophecy relates in its fullness to Rome or to some other object or objects of which Rome is a type.